The New Jersey Department of Environmental Protection (DEP) faced a ripple of controversy last week when environmental groups attacked its proposal to cap annual carbon emissions by electricity generators at 18 million tons per year. Environmental groups were pushing for a cap as low as 12 million tons. 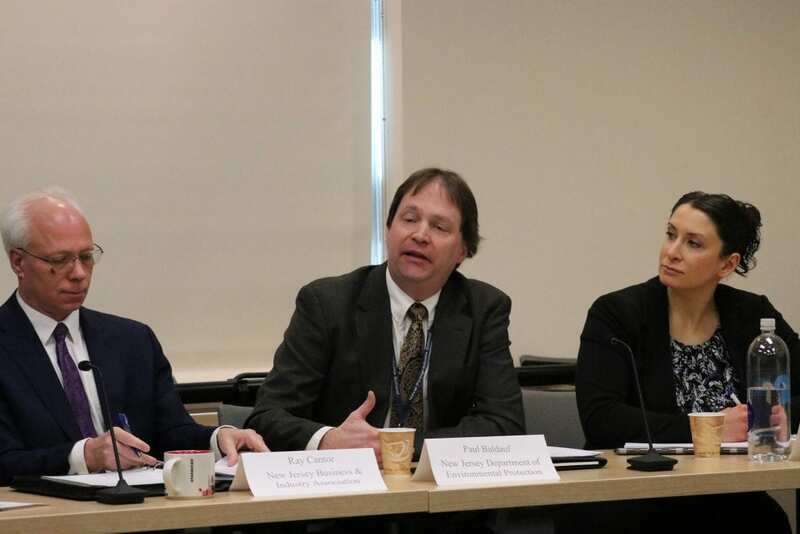 But as DEP Assistant Commissioner Paul Baldauf explained Friday at NJBIA’s headquarters, a lower cap would likely increase overall carbon emissions in the airshed, as well as hit ratepayers with much higher costs. DEP Assistant Commissioner Paul Baldauf (center) with NJBIA Chief Government Affairs Officer Chrissy Buteas and Vice President of Government Affairs Ray Cantor at Friday’s meeting. Baldauf, who is in charge of DEP’s Air Quality, Energy & Sustainability programs, was a guest speaker at NJBIA’s Environment and Energy Policy Committee meeting, where he touched on issues such as fumigation regulations, electric vehicles, transportation pollution and other topics. He was joined by Richelle Wormley, assistant commissioner for Compliance and Enforcement. The carbon cap proposal is a result of New Jersey rejoining a regional cap-and-trade program, Regional Greenhouse Gas Initiative (RGGI). That decision was Gov. Phil Murphy’sand the level at which to cap emissionswas based upon extensive modeling of New Jersey’s electric generation sector. The regulations for rejoining RGGI were proposed in December, and the comment period closed on Friday. (View NJBIA’s comments here.) DEP will revise the regulations and then issue the final rule later this year, possibly as early as May. In addition to the cap, they will cover how generators who don’t meet the cap will obtain allowances, how the allowances will be auctioned off and traded, and how the state will divide the revenues from these trades. But the issue of leakage will figure heavily into how the program works. Leakage has to do with where New Jersey gets its power. If the cap is too strict, and a large number of New Jersey power plants can’t meet it, then users will get energy from out of state. New Jersey is part of the PJM power grid, as are a few of the RGGI participants. Pennsylvania and other states are part of PJM but not RGGI. It is not appropriate for DEP policy level officials to meet and discuss a pending rule proposal after the public comment period has closed and prior to adoption of the rule. This NJBIA meeting effectively extended the public comment period for the benefit of a single interest group. Unethical and very bad regulatory move. Why would the you (that’s you, DEP) Even have to be reminded of this? In addition, the “optics” – if to the technical legal ethics – are bad with respect to Ray Cantor and the revolving door. That creates a reasonable fact based public perception of inappropriate influence. The “leakage’ ISSUE IS A STRAW MAN. Under the Global Warming Response Act, DEP and BPU have authority to issue a “greenhouse gas emissions portfolio standard” that all energy must meet. That standard effectively would force imports to meet NJ’ carbon standard and resolve the leakage issue. They have not used that power.